The easiest way you can find out your ring size accurately is to pop into us here at Pledge’s where a member of staff can simply measure your finger accurately which will only take a minute. If you are unable to get into one of our stores you can simply use the guide below to measure your finger as best as possible. 3. Measure the string against a ruler to get the circumference. 4. Divide that by 3.14 to get the diameter of your finger. 5. 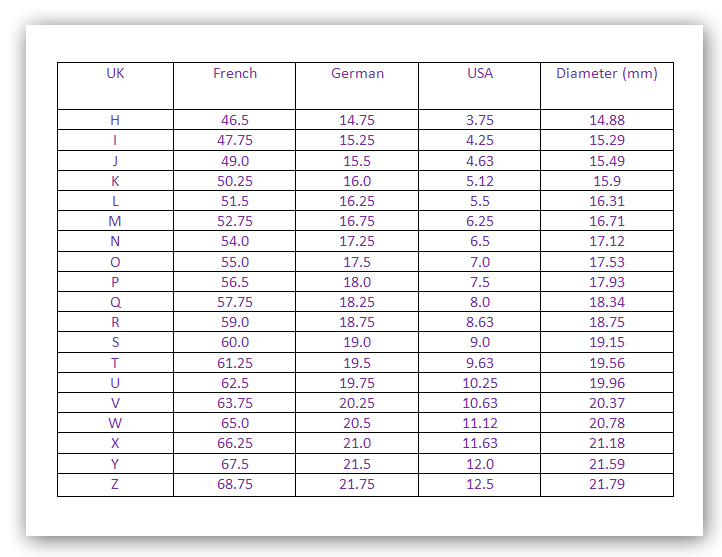 Look up your ring size using the table below. Do you have a ring that needs re-sizing? Why not pop it into us and we can do it for you. We charge as little as £11.00 for 1 size up or down. If you wish to purchase a ring from us, it can be re-sized before we dispatch it to you. You just need to let us know what size you need. Charges may apply to this service.